However, eREITs had grown expensive as a result of interest rates reaching historically low rates over the last 9 years. Investors primarily rely on eREITs for a steady and growing income stream which competes with bonds. As bonds got more expensive, so did eREITs. Over the last few months, interest rates have accelerated upwards, bond prices have fallen, and so have the prices of eREITs pushing their dividend yields higher. Unlike bonds which have a fixed coupon, eREITs have the ability and the history of raising their distributions over time. While bond prices are fixed by their coupon rate and maturity date, eREIT valuations increase over time by growing their asset base and through increasing lease rates on the properties and equipment they provide to their tenants. This has allowed eREITs to perform well in rising rate environments despite the initial market response to lower eREIT valuations. 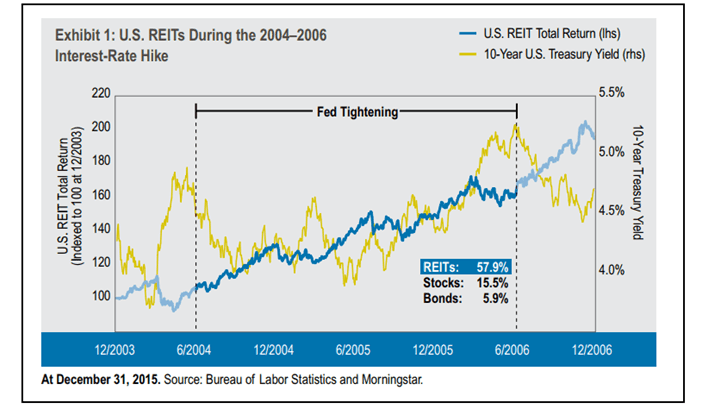 From the chart above, it is clear that REITs generally perform very well during periods of rising interest rates, often beating out US non-REIT stocks. To understand why eREITs perform well during and following periods of rising interest rates, we only have to look at what is happening in the overall economy. The same economic environment that causes the Federal Reserve to raise short term rates and the bond market to increase long term rates (economic growth, low unemployment, rising wages, rising price inflation) is the same economic environment that allows eREITs to grow their revenue, cash flow, and earnings. The initial investor reaction to rising interest rates is to sell eREITs but that initial reaction only impacts the subsequent quarter or two. In the longer term, eREITs typically perform well in rising rate environments. Readers interested in more detail on this subject are directed to a Cohen & Steers article. The newest tax legislation which was recently signed into law by President Trump was the result of much lobbying and balance between provisions that decreased taxes and those that increased taxes to prevent a complete blowout of the US Federal debt in future years. One of those provisions is the pass-through income deduction for partnerships and other pass-through entities like REITs. The pass-through deduction allows investors in partnerships, including Master Limited Partnerships (MLPs) and REITs to deduct 20% of business income from their taxable income. In simple terms, this allows an investor to shield 20% of ordinary REIT dividends (excluding Return of Capital distributions) from Federal income taxation. This pass-through deduction was needed to keep the taxes on partnership and REIT income on par with corporate income. Partnerships and REIT’s profits are not taxed at the corporate level either under the old tax code or the new tax code. When Congress decided to lower the top corporate tax rate from 35% to 21%, the tax benefit of partnerships and REITs would have been eroded. To preserve the tax benefit of entities structured as partnerships or REITs in relation to the new corporate tax rate, the pass-through provision for REITs and partnerships was added. The result is that ordinary (not ROC) REIT dividends are more valuable to investors for 2018 and beyond than they were in 2017 and prior. As noted in the introduction above, there are always a few bad apples in the barrel. I’ve attempted to list eREITs that should do well in the slowly rising interest rate environment in which we currently find ourselves and to cull out the bad apples. The table below lists nine eREITs that have strong performance histories, solid balance sheets, and well covered dividend distributions. It should be noted that the dividend compound annual growth rate (Div CAGR) in the table is based on five years of dividend distributions with an exception for DOC which is based on 3 years. DOC is a relatively new eREIT and does not have a 5 year history. Provided below is a short description of each of the eREITs in the table above with a little color added on why the eREIT should continue to do well. VTR and HCN – Ventas (VTR) and Welltower (HCN) both invest in senior housing and other healthcare properties. With our shifting population demographics, the over 85 year old crowd will increase from about 8 million in the US today to 20 million by 2050, a two and a half fold increase. That aging population will require more medical care facilities and more senior housing over the next 30 years. There will be plenty of clients for VTR’s and HCN’s facilities. DOC – Physicians Realty Trust (DOC) is a relatively new eREIT that specializes in medical office buildings (MOB). With the passage of the Affordable Care Act (ACA) and our aging population, demand for MOB space is up and continues to rise. DOC takes a very conservative approach to acquiring MOB assets and its accumulation of debt. For the first 3 years after its IPO, DOC froze its dividend distribution preferring to use its increasing cash flow for acquiring new properties rather than increasing its dividend distribution. DOC has just recently increased the dividend it pays. With growth continuing, DOC should be able to maintain steady dividend distribution increases going forward. OHI – Omega Healthcare Investors (OHI) is a well established eREIT that is heavily invested in skilled nursing facilities (SNFs) and does rely significantly on Federal Medicaid payments. This is the main reason that OHI offers a high yield of 10%. Investors perceive that OHI has a higher risk as a result of its significant reliance on Medicaid payments. OHI has a number of positive attributes that I believe outweigh that risk. Seniors are heavy users of SNFs and with the growth of senior citizens in the US and globally, there will be no shortage of clients for OHI’s facilities for the next 30 years. OHI also carries an investment grade credit rating and maintains a solid balance sheet. SBRA – Sabra Healthcare (SBRA) is similar to OHI and offers a similar yield of 10.2% and has a similar risk profile as OHI. SBRA recently received an upgrade in its credit rating to investment grade and its dividend has even better coverage than does OHI. One item to note on SBRA is that most of the financial sites are incorrectly reporting SBRA’s dividend and yield. The error stems from SBRA’s acquisition of Capital Care Properties (CCP) this last summer. SBRA, in August, paid out a prorated dividend shortly before completing the acquisition. The balance of the third quarter dividend ($0.07) was paid in November along with an increase of the regular quarterly dividend to $0.45. The financial sites are incorrectly reporting SBRA’s quarterly dividend as $0.52 per quarter versus the correct $0.45. This will be fully corrected after the next dividend payment. The data in the table above is correct. O – Realty Income (O) (The Monthly Dividend Company) has been in existence since October 1994. An investment in Realty Income at IPO would be worth roughly 3100% more today considering price appreciation and dividend payments. Realty Income has paid a steadily rising dividend for more than 48 years having been founded in 1969. Realty Income has diversity in tenants and geography, carries an investment grade credit rating, and a solid balance sheet. With economic growth picking up speed, Realty Income’s tenants will be looking to expand into additional space and occupancy should improve. With most of Realty Income’s debt being financed under fixed rate terms, increases in interest rates will have a muted impact on operations. As icing on the cake, Realty Income pays a monthly dividend. STAG – STAG Industrial (STAG) invests in warehouse and light industrial spaces. STAG fills a niche in Tier II warehouse space in that is sorely needed by smaller growing retailers and light industrial companies in the US. The eREIT has a conservative process for selecting new buildings for acquisition to ensure expected returns are generated. Like Realty Income, STAG pays a monthly dividend. IRM – Iron Mountain (IRM) is a unique eREIT owning primarily paper document and digital media storage assets. IRM essentially rents out physical space or digital storage space for documents that must be retained by corporations and government entities. In addition, IRM provides document destruction services for sensitive material. Readers should note that IRM has exhibited strong dividend growth over the last 5 years at 16.8% annually. IRM just completed a major acquisition which should add materially to its revenue and earnings going forward. With economic growth picking up, there will be more demand for IRM’s storage and document destruction services. CLDT – Chatham Lodging Trust (CLDT) is a hotel eREIT specializing in second tier lodging properties (e.g. Hampton Inn and Embassy Suites). CLDT has a number of their hotel properties located near shale oil production facilities. With increased general economic activity and increased shale oil production, CLDT should experience strong growth in occupancy, revenue, and earnings over the next two years. Readers will note that I have no traditional retail shopping center or mall eREITs listed in the table above. Despite the high dividend yields, I believe the continuing risk from changing shopping trends and increased e-Commerce will continue to depress traditional retail shopping center eREIT revenue and earnings. I expect to see additional retail store closings and bankruptcies though 2019. My personal portfolio contains no traditional retail investments at this time. I consider traditional retail shopping eREITs to be “bad apples” at this time. For more detail on why traditional retail is not on the buy list, readers can find my most recent article on the subject here. I believe the current downward pressure on eREIT market valuations due to rising interest rate jitters is short term (1 -2 quarters). This provides an opportunity to pick up solid eREIT companies at much lower prices than were available just 3 months ago. Many equity REITs will perform well during this period of slowly rising rates. While not yet widely known, the recently passed tax reform legislation makes eREIT dividend distributions more valuable to investors via the new pass-through income provision exempting 20% of REIT ordinary dividends.